for destinations all around the world, for different types of travelers. This installment: Jeddah, Saudi Arabia. 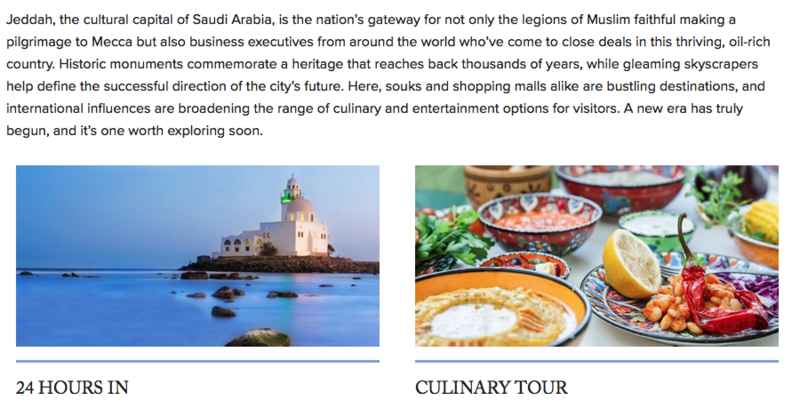 While I wrote these itineraries for Jeddah, I put myself in the mind of executives who’ve been told they have to attend business meetings in Saudi Arabia’s commercial capital. What would they want to know and to see in their downtime? The one thing that stuck with me, though, was the cuisine and culinary ingredients. Shakshuka! Coffee-date pudding! Orange-blossom mints! Mouhalabieh! Mint vinaigrette! The screenshots below have been saved on my desktop since last October as prompts to research the recipes and re-create the dishes (closer to home, where they could be accompanied by a digestif or a mimosa). Head here for a two-day “Culinary Tour” piece — which includes an embedded photo of a spice market in the article that inspired me to log onto the Penzeys website — and here for a whirlwind “24 Hours In” itinerary.